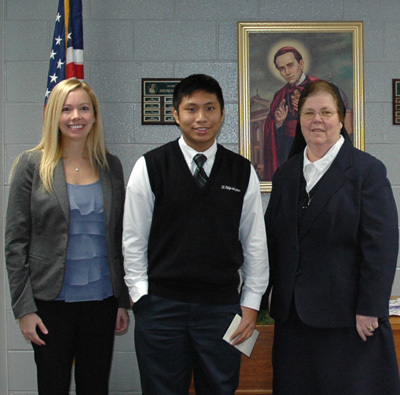 Neumann Scholar David Carangan, center, poses with the Connelly Foundation’s Kim Simmons and with the principal of SS. Philip and James School, Sister Helen Thomas, I.H.M. David Carangan, an eighth-grade student at SS. Philip and James School in Exton, has been awarded a Neumann Scholarship, the school announced Tuesday, Dec. 9. The four-year scholarship to a Catholic high school, which was granted by the Connelly Foundation, is based on a competitive examination. This year 897 students in the Archdiocese of Philadelphia took the exam and 35 scholarships were awarded. The scholarship was presented to Carangan by Kim Simmons from the Connelly Foundation in the presence of Sister Helen Thomas, I.H.M., school principal, and the fifth through eighth grade students and faculty. Carangan has already earned a partial scholarship to Bishop Shanahan High School in Downingtown. Last year he placed first in the region and fourth in the country in the National Catholic Math League competition. Since 1996 SS. Philip and James School has had 17 Neumann Scholars. Last June eight of the school’s eighth grade graduates won scholarships to various high schools in the area.